The time is now. No tricks. No politics. Just real people making real music. Justin Smith Music and FatRat Da Czar are...@Colorblind. 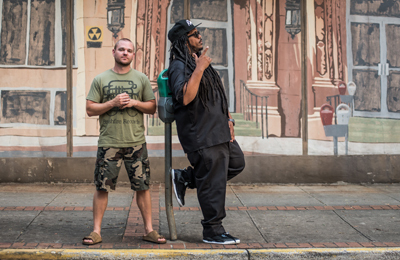 The first time Columbia rapper Fat Rat Da Czar and Lexington singer-songwriter Justin Smith worked together was in 2005, when the two hopped into Smith’s Jeep Cherokee bound for an Atlanta recording studio. Fat Rat, a hulking man with chest-length dreadlocks, rode shotgun next to Smith, a small-town kid with a blond buzzcut and a heavy Southern accent.They didn’t talk much. They didn’t know each other well enough. When Smith put the mellow-mooded Jack Johnson in the CD player, Fat Rat stayed silent. When he put hip-hop group Goodie Mob’s “Soul Food” in the player next, however, Fat Rat said, “This is my kind of guy right here.” In Atlanta, the two recorded a song for Smith’s upcoming solo album. Then Fat Rat asked Smith return the favor on his next record. They fleshed out ideas and melodies. Fat Rat, six years Smith’s senior, shared tips on the music business. Smith got Fat Rat hooked on Ben Harper. Fat Rat brought Smith reggae legend Peter Tosh’s records. They discovered a shared love of 2Pac. “It’s really the most natural friendship there is,” Fat Rat said. After years of collaborating on each other’s solo projects, the friends spent the past two years recording as a duo. Their self-titled debut, “Colorblind,” comes out Tuesday, Sept. 1.